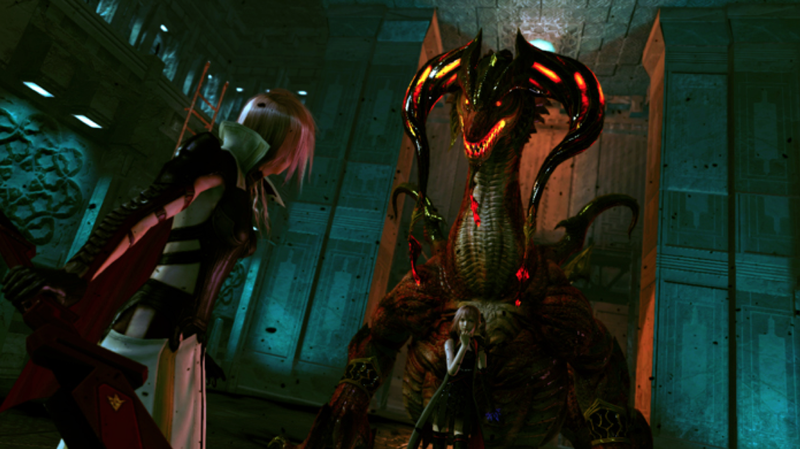 With less than a month till it’s February 11th release for the PlayStation 3 and Xbox, Lightning Returns: Final Fantasy XIII released its fully playable demo to fans hoping to take an early look at the game and familiarize themselves with the game mechanics – and Square-Enix couldn’t have done a better job. With initial cutscenes that seem reminiscent of Assassins Creed 2’s ‘carnival’ trailer, I expect big things from this game. From the moment you hear the main theme, you can tell this is going to be an amazing game. The score is impressive as always and just really sets the mood for the game. Beyond that, the opening actually reminded me a lot of Assassins Creed 2’s initial trailer. Not game mechanics-wise of course, but rather the architecture and liveliness of the scene. This end of the world party in the city of Yusnaan might as well be Carnival in Venice. As you’ve probably heard by now, the battle system has been completely redone. 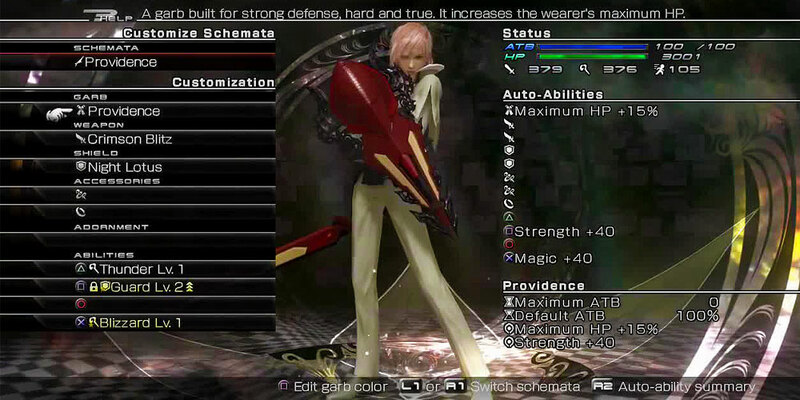 It’s fairly similar to the system used in Final Fantaasy 7: Crisis Core, but still with some huge differences. Instead of paradigm shifts, you change costumes – which are called schema – and this not only changes your battle options, but also resets your ATB bar so rapid switching is key. Each button has a different attack, and these change according to the schema you’re currently using. Usual staples like attack, blitz, froststrike, blizzaga, etc all return, but there are also some new ones that have interesting bonus effects. Some attacks can temporarily incapacitate an opponent, while others can heal upon attacking – which comes in very handy considering health doesn’t reset after a battle. Yes you can move freely in battle, but don’t expect to run around avoiding attacks with ease. You have to learn how to time blocks and counters properly. Each button hit drains a certain amount of ATB (which determines your actions) so you always want to leave a little bit for guarding – unless you want to make the most during a stagger. Speaking of which, staggers are also different this time around. Each monster has different criteria for raising their stagger level. 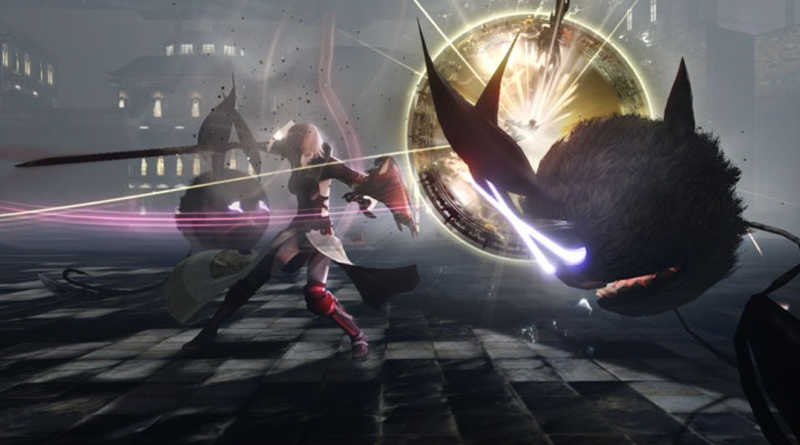 For example, in the boss battle staggers occur most commonly when you strike the head of the beast – which is very easy if you just used heavy attacks to bring it to the ground. As previously mentioned, each schema completely changes your battle options and abilities. Some give more health, others strength, and some can even give you new abilities. It all depends on how you mix and match your costume, weapon, shield, and accessory. Each customizable item can only be used with one schema at a time, but duplicate items can be acquired so you really can have cross overs if you feel the need. From the demo it seems as though you are able to have 6 schema created at a time, but can only use 3 in battle. Whether this will change in the full game or as you progress, we’ll have to see. Considering we’ve always been able to choose from 6 in battle, I think we might get full access at some stage in the game as we level up. Considering it’s just a demo, we don’t get to really experience much of the Doomsday countdown clock. Once the game comes out we’ll really see what this is all about, but apparently here’s how it works. As you know, you only have 13 days to save the world. What this translates into for in-game time we’ll have to see, but as time passes different things will happen. For example, some missions will only be available at night. Also, as time progresses enemies will get stronger. There is also apparently a way to increase time by literally buying it. Whether or not there’s a limit to this and how to farm this ‘extra time’ I will discuss in a later tips and tricks article – again, after the game comes out. Either way, I’m sure there will be a New Game + option for those who didn’t complete everything they wanted to and want to jump back in with some carry over from their previous game session. This demo also introduces a new system called Outerworld that connects in-game elements not only to social media, but also to other players around the world. The full extent of this system remains to be seen, but it appears to be a way for players to help each others out, cheer them on, and also give them little goodies from beyond the game. 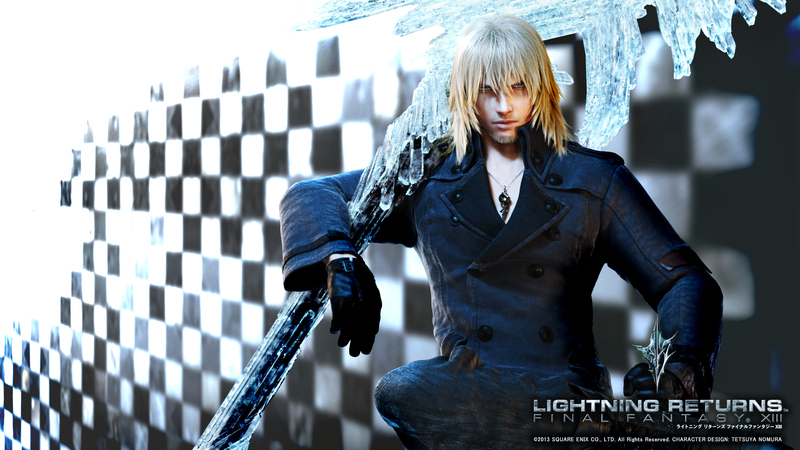 Despite at first seeming like a brief reunion, it seems as though the battle between Lightning and Snow will be quite central to the story. Despite this demo taking place in a relatively short amount of time, you can discern some story elements. Besides the whole “Lightning needs to save the world from sinking into chaos part”, we also see how the years have changed certain characters. In this demo we see how Snow has lost hope and seems to be of particular interest to the imp-like doppelganger of Serah named Lumina. He still bears the mark of the l’cie we saw in Final Fantasy XIII-2, so we will most likely learn all about it in this game. With tons of characters returning, it seems as though this game will perfectly tie up anything ever hinted at in prior installments. Apparently there is supposed to be humor in the game, but from the demo all we find is darkness and a sense of urgency – which is fine. Hope Estheim returns and does quite a bit of talking in Lightning’s ear, but considering we need some background on what exactly is going on, it’s perfectly acceptable and adds to the story quite well. 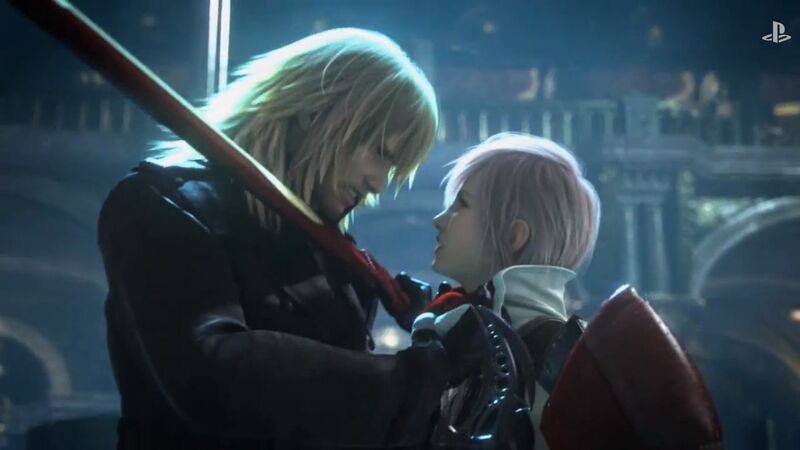 Personally, I want to see how Caius and Noel have changed in all this – since they both are supposed to appear in Lightning Returns -, and again to see what role Snow is playing in all this. Each installment has made Snow more awesome, and in this game he exceeds all expectations. Even his powers have exponentially increased from before. I’m just worried what Lumina will try to make him do – again, since she does look an awful lot like the woman he loved, but died. My knowledge of Final Fantasy games is limited to only 7 and 13 – and their related stories – but common consensus seems to confirm that this game take Final Fantasy into a whole new realm. For one reason or another some people have always knocked the XIII series, but I personally loved it. 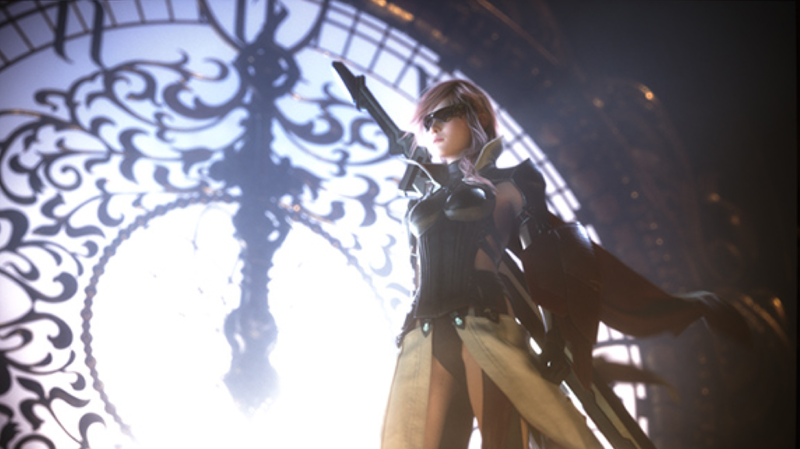 Its compelling characters, rich story and exotic environments are what draw people to Final Fantasy in the first place. I couldn’t be happier with this demo and am even more excited for the full games US release. We may never have gotten the Final Fantasy 7 remake we wanted, but this final installment to the XIII saga seems to have been made with us fans in mind, and I applaud Square-Enix for the outstanding job they’ve done. If you activate the Outerworld services and post your score after defeating the Zaltys (the dragon), you will receive the ‘Siegfried’ outfit in the full game. Playstation users will receive an added bonus of the Utsusemi Garb DLC. This DLC includes the Heavenly Fan weapon and the Kaminari (‘lightning’) shield item and will be available for purchase later this year, so why not get it for free now? It’s also not to late to preorder you game. With tons of bonuses, including a Final Fantasy VII package, preorders have never seemed so desireable. 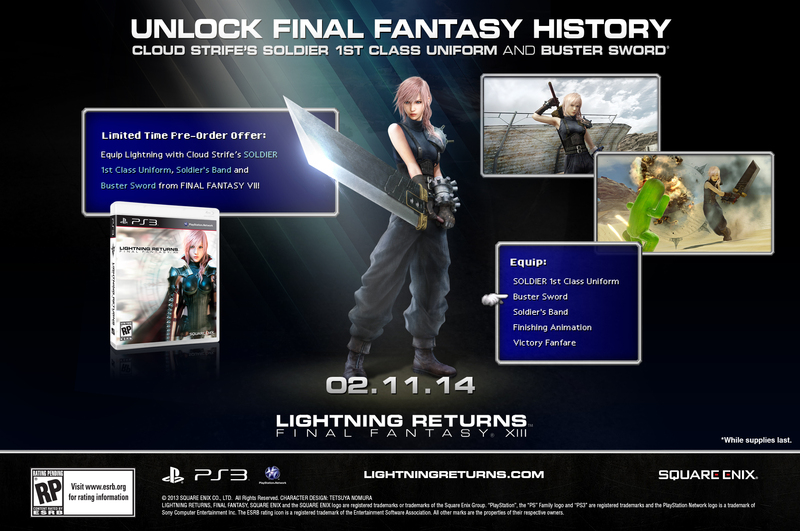 I personally ordered the Collector’s Edition from Square-Enix’s website. 80 page art book, more costumes and a pocket watch? Yes please!